SS Heimwehr "Danzig" was an SS unit established in the Free City of Danzig (today Gdańsk and environs, Poland) before the Second World War. It fought with the German Army against the Polish Army during the invasion of Poland, and some of its members committed a massacre of Polish civilians. 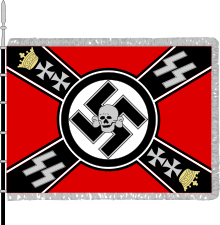 After this it became part of the 3rd SS Totenkopf Division and ceased to exist as an independent unit. Also known as Heimwehr Danzig (Danzig Home Defense), it was officially established on 20 June 1939, when the Danzig senate under Albert Forster decided to set up its own armed force; a cadre of this new unit primarily formed the Danzig SS Wachsturmbann "Eimann". 2 The SS Wachsturmbann "Eimann"
Reichsführer-SS Heinrich Himmler supported this project and sent SS-Obersturmbannführer Hans Friedemann Götze to Danzig. Goetze was the commander of the III. Sturmbann (Battalion) of the 4th SS-Totenkopfstandarte "Ostmark," established in October 1938 in Berlin-Adlersheim. The III. Sturmbann was strengthened with the help of anti-tank defense forces (the Panzerabwehr-Lehrsturm of the SS- Totenkopfstandarten) as well as about 500 additional volunteers from Danzig who named their new unit SS Sturmbann "Goetze". It was formed to conduct police actions in and around Danzig. The Danzig SS-men had been members a special SS troop established in July 1939 - the Wachsturmbann "Eimann" - and at the beginning of August this self-named Sturmbann "Goetze" reached the peninsula at the mouth of the Vistula called the Danzig Westerplatte. There it hid on German ships, including the naval training ship Schleswig-Holstein. The Volksdeutsche (ethnic Germans) in Danzig founded the 1,550-man strong Heimwehr Danzig (Danzig Militia). On 1 September 1939, German troops attacked Poland. The Heimwehr Danzig took part under German Army command and in the process captured the Polish post office after fifteen hours; an event which Günter Grass dedicated a chapter of his novel The Tin Drum to. During the attacks, the German forces used ADGZ armoured cars, 75mm and 105mm artillery and flamethrowers against Polish forces armed with pistols, rifles, light machine guns and grenades. The SS-Heimwehr Danzig participated in the attack on the Danzig Westerplatte, and already was considered a part of the 3rd SS Totenkopf Division then forming under Theodor Eicke. Later, it provided coast guard services in Danzig. On 8 September members of the SS Heimwehr Danzig killed 33 Polish civilians in the village of Ksiazki. Other such militias were also involved in war crimes perpetrated on Polish civilians. On 30 September 1939, the Heimwehr became part of the 3rd SS Panzer Division Totenkopf, forming the cadre of its artillery regiment. The SS Wachsturmbann "Eimann" was set up in early June 1939 in Danzig by then SS-Sturmbannführer Kurt Eimann and was considered as an armed reserve of the Danzig SS-Standarte 36. It was used also in the Volksdeutsche (ethnic German) areas of the Polish Corridor, in order to induce ethnic Germans to join the SS, particularly the Totenkopfverbände. The SS Wachsturmbann Eimann committed a number of massacres in the region between Karthaus and Neustadt in Westpreußen from 13 September 1939. Most of the people murdered were Jews. The SS Wachsturmbann Eimann was disbanded in January 1940, with its members being transferred to the Totenkopf division. After the "reunification of Danzig with the German Reich," the Wachsturmbann "Eimann" provided the staff for the newly established concentration camp Stutthof near Danzig. The Nazi government also employed it for "special police tasks" in the new Reichsgau Danzig-Westpreussen, which means it was used to persecute and imprison Polish Jews. Sydnor, Charles W. (1990). Soldiers of Destruction : The SS Death's Head Division, 1933-1945. Princeton, New Jersey: Princeton University Press. ISBN 0691008531. This page was last edited on 22 September 2017, at 00:03 (UTC).